CHICAGO, Illinois (CNN)– There was a moment last night– this was just before Barack Obama and his family walked onto the stage in Grant Park for his first public appearance as president-elect– when the throngs of people in the park fell almost completely silent. In one respect this was a product of an explicable glitch in the proceedings. 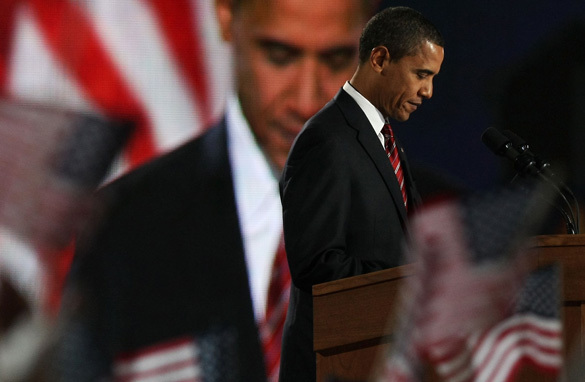 During the long campaign, the timing of Obama’s entrances at rallies was meticulously coordinated– the preliminary orators (usually local government officials and candidates) spoke, the music and its pacing built up with the intention of quickening the pulses of the crowds, and then, at exactly the right moment, Obama, the candidate, would make his entrance. But by late last night Obama was no longer a candidate, and there was no need to pump up the sense of anticipation, and the evening’s events– the concession call from John McCain, the congratulatory call from President Bush– were being dealt with as they rapidly occurred on a timetable Obama’s staff could not control. So there was some dead time in the park before Obama appeared on the stage. Here– in the days and weeks and years ahead– comes life; here comes events that know no schedule, that can’t be planned, that will appear on no carefully constructed itinerary. Here we are– we, the people in Grant Park; we, the people of the United States; we, the people of the world. Here we are, and none of us– not even and especially the man on the stage, the man just elected to be the 44th president– can be sure of what lies ahead. If some in the audience– those of us in the park, and those watching around the world– sensed perhaps the slightest sliver of a subdued tone in Obama’s voice, a perceptible difference in his timbre, if not his words, from how he had sounded on the campaign trail, the shift was understandable. It may have been his own version– intentional or involuntary– of that sudden silence that fell over the crowd. He can’t be silent, in any sense of that word– he is going to be the president. But during that same span late last night when the audience, in its brief hush, seemed to be acknowledging that everything– everything– had just changed, so, too, Obama appeared to be sending the signal, to the rest of us and maybe to himself, that he was well aware of the change, and was already beginning to deal with it. He is no longer a candidate seeking something. Last night’s Chicago weather– so warm and inviting for November– was deceptive; it will not be warm here very much longer. Obama, of all people, knows that; he has lived in Chicago long enough to realize that balmy days with winter coming are the most predictable of teases.